Drug use composite membrane generally by the base material, block material, adhesives, heat sealing materials, printing ink layer and protective layer of coating. 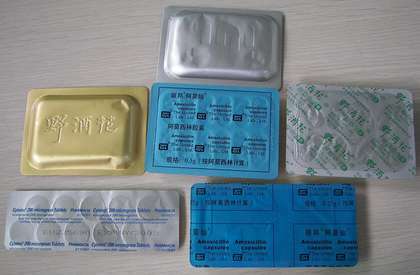 Drug use composite membrane generally by the base material, block material, adhesives, heat sealing materials, printing ink layer and protective layer of coating.The structure of the commonly used for: surface layer/block/adhesives/heat sealing layer/adhesives. (1) surface: the commonly used surface materials such as PET, BOPP, PT, paper books printing, surface material should have excellent printing packaging, strong resistance to heat, friction resistance, durable thorn, such as performance, protection effect to the middle tier. (2) the intermediate blocking layer: the commonly used material with aluminum foil (AL), aluminum plating film, PVDC, BOPA etc, these material is dark agfa, can prevent penetration of internal and external gas or liquid. (3) heat sealing layer: the commonly used materials such as PE, PP, EVA, have chemical inertness, non-toxic, good heat sealing, mechanical strength and heat resistance. (4) adhesive, adhesive coating in between two layers of materials, with the strength of the bonding force and surface itself, the adjacent two materials bond together. (5) the way of printing and coating protective coatings: gravure composite membrane is the main way of printing department, at present, the development of the flexible printing film also soon.Protective coatings generally refers to the table after printing printing layer coated on the surface of a layer of colorless transparent glazing oil, dry protect the printing quality and increase the print gloss.